Sneaking a cigarette in the school bathroom? How quaint. Today's teens have taken to vaping, an alternative to smoking that's so discreet they can do it without even leaving the classroom. 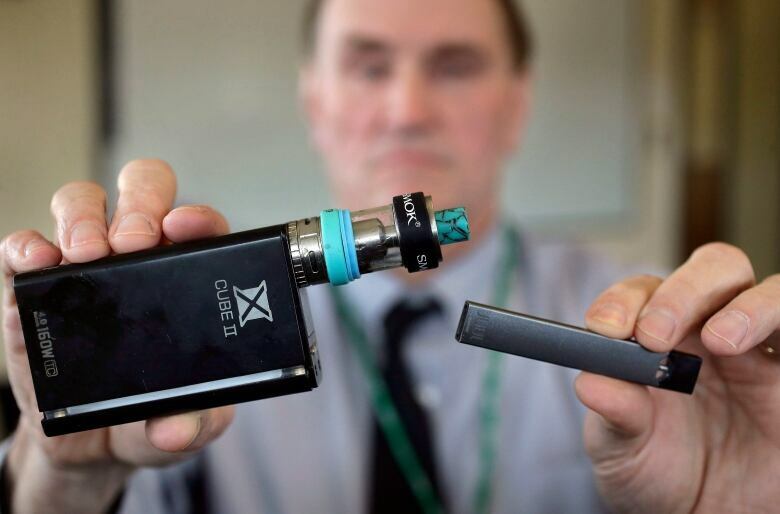 The devices heat liquid into an inhalable vapour that's sold in sugary flavours like mango and mint — and often with the addictive drug nicotine. They're marketed to smokers as a safer alternative to traditional cigarettes, but officials say they're making their way to teens with surprising ease. 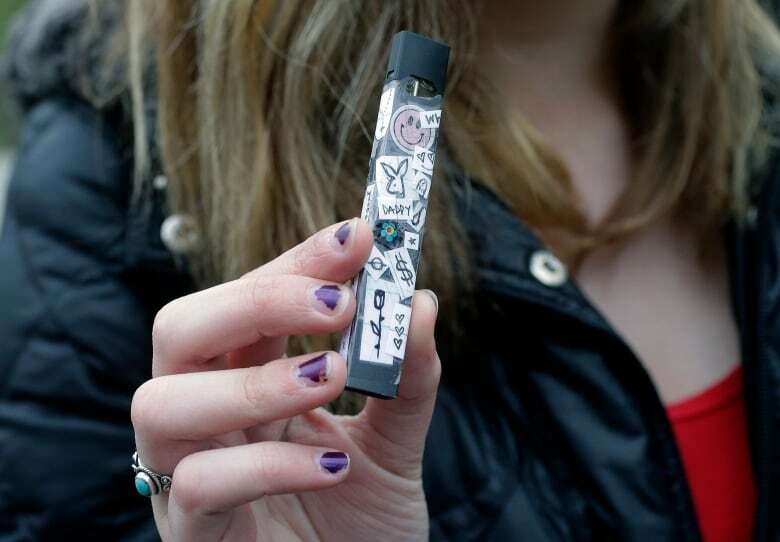 A new wave of smaller vapes has swept through schools in recent months, officials say, replacing bulkier e-cigarettes from the past. It's now common in some schools to find students crowded into bathrooms to vape, or performing vape tricks in class. "We've seen significant increases across the student body," said Robert Keuther, principal at Marshfield High School on the south shore of Massachusetts. "This is not something specific to one group of kids. It's across all of my grades, nine to 12. It's all students." The U.S. Food and Drug Administration issued a warning to retail stores as part of its new operation against illegal sales. It also requested marketing and design documents from the maker of the Juul, a popular vape product that is shaped like a flash drive. The agency says it's looking into whether certain features are specifically appealing to young people. The device's maker says it's intended only for adults trying to quit smoking. Its website aims to block underage customers, and the company says it supports legislation to raise the minimum age for vaping products to 21 across the U.S. But critics say the Juul's sweet flavours and stealthy design seem to be aimed at kids. In an April 18 letter to the FDA, a coalition of medical and health groups called for a suspension of online sales until authorities create stronger rules against underage sales. "There's a reason why it's marketed that way," he said, referring to the Juul's concealable design. "We wish there was a way to curb that, because the industry is clearly targeting younger kids." Whether schools' efforts are making a broader difference has yet to be seen, though. Teen vaping decreased for the first time in 2016 after rapidly rising for years, according to the Centers for Disease Control and Prevention. Updated numbers are expected in June. Medical experts are still trying to understand the potential risks tied to vaping. Most agree that it's safer than smoking traditional cigarettes, but little is known about long-term effects. And while research has found trace amounts of chemicals like formaldehyde in many e-cigarettes, it's unclear whether they exist at levels that can cause health problems. Some students say that it's better to be vaping than using cigarettes or other drugs. Cameron Uldricks says he vapes almost every day but has never smoked tobacco. And even though it landed him a suspension from his high school near Columbus, Ohio, the 17-year-old said he has no plans to cut back or quit. "Honestly they treat it like frigging cocaine," said Uldricks, a sophomore at Worthington Kilbourne High School. "What would they rather have me do, smoke cigarettes or vape?"